MANILA, Philippines – The long wait is all over! This is it! The “Battle for Greatness” is already in our hands. Before the day ends, the whole world will know who is the real pound for pound king between Manny “Pacman” Pacquiao and Floyd “Money” Mayweather Jr. on Sunday, May 3 (Saturday, May 2 US Time) at the MGM Grand Arena in Las Vegas, Nevada, USA. BREAKING NEWS: Floyd Mayweather Jr retains his clean record by outscoring Manny Pacquaio after 12 rounds of intense boxing. 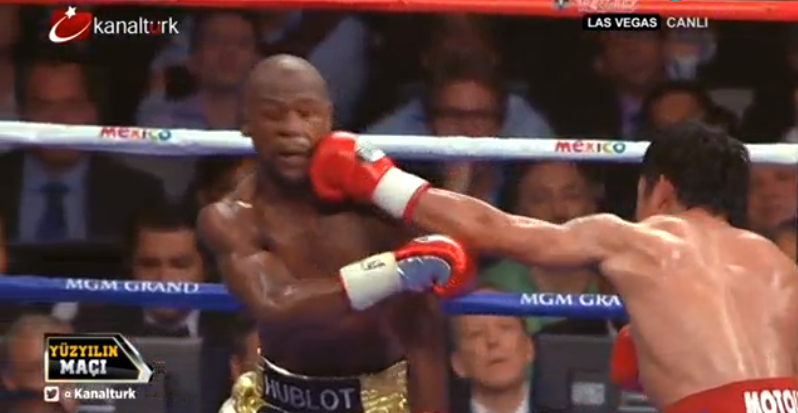 Mayweather is the World’s Greatest! Decisions Pacquiao unanimously. The official weigh-in yesterday tells a lot of story for this once in a lifetime event. The jam-packed MGM Grand Ballroom was filled with Pro Pacquiao audience which means, majority of boxing fans are on the Fighting Congressman from Philppines’ side. An online survey was also conducted and 51% goes to Pacquiao to win the fight while Mayweather who is the obvious front runner and highly favored months ago garnered 49% a day before their duel. The serious face of Floy Mayweather Jr. indicates that he is not taking this fight lightly compared to his reactions on his previous fights where the Undefeated American used to trashtalk his opponents and their coaches. 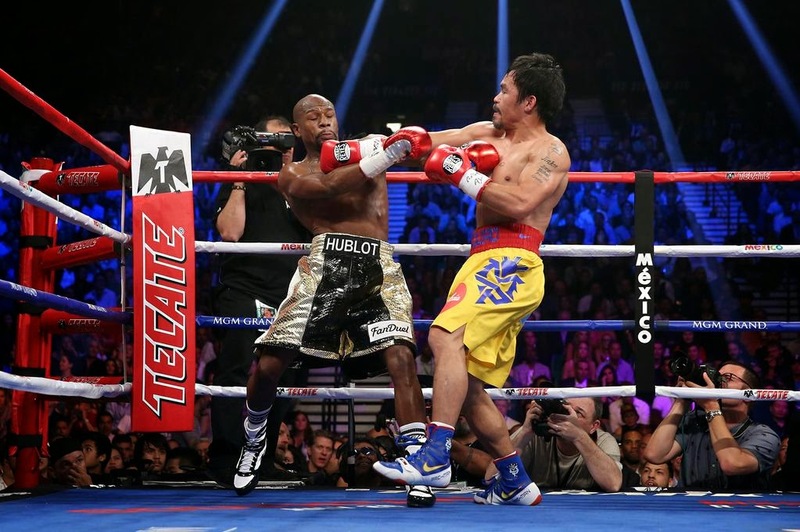 Many believe that Pacquiao is a real threat to Mayweather’s immaculate 47-0 record. But well-known Sports Analyst, Stephen A. Smith of ESPN reiterates that Manny has a zero chance in beating “Money” Mayweather. Smith even struck at Pacquiao, when the Filipino Fighter told on air that Mayweather is beatable and called this blasphemous. 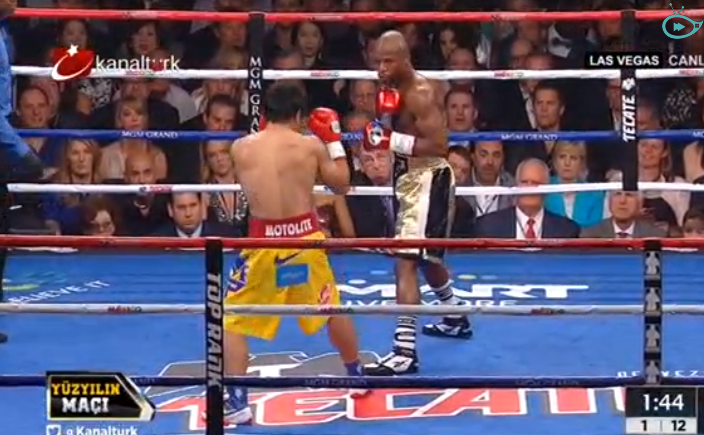 In contrast to Floyd’s reaction during the wigh-in, Manny showed a very positive vibe and attitude. Confident is what can describe Manny Pacquiao. He even took a selfie with his entourage on his way to the stage for the scaling and continuously waved his hand at the crowd. No wonder why majority of boxing fans around the globe are on his side. This is it, there’s no more stopping the 2 great fighters of our generation. They were weighed and pass the 147-lbs limit. After 12 thrilling rounds of a historic boxing event, one fighter will be hailed as the: World’s Greatest. 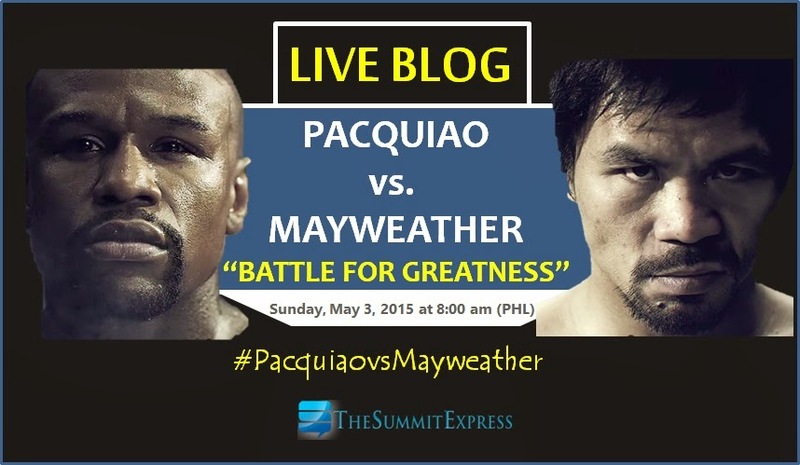 Join us as we bring LIVE updates, full results and Pacquiao vs. Mayweather main event highlights brought to you by The Summit Express! - Philippine National Anthem to be sung by Pastor Friends of Manny Pacquiao. - Stars Spangled Banner performed by Jamie Foxx. - Manny now on his way to the ring. - Both fighters are now on the canvass.